This moist eggless christmas fruit cake is the best ever! You would never guess it’s a healthy vegan recipe. Moist, easy to make and tastes rich and sweet – all with NO OIL!!! Line a baking dish with some non-stick parchment paper. I used a square 20 x 20cm (8x8inch) dish. Put all of your dried fruit into a large pan or pot and add in the pineapple and spices. Also add in the orange juice. Turn on the heat and bring to a slow boil, the reduce the heat and keep on a high simmer for 3 minutes. Stir constantly so that the mixture heats through evenly and starts to soften and caramalize slightly. Remove from heat and set aside. To a large mixing bowl, add the flour and baking powder and give it a stir to combine well. Then add in your flax "eggs" and fruit mixture into the mixing bowl and stir really well until all of the flour and fruit mixture are well combined. Pour into your lined baking pan and spread the batter evenly. Bake for about 1 hour or until a skewer comes out clean from the center of the cake. Let your cake cool for at least half an hour or store in the fridge until ready to serve. Enjoy! This cake can be frozen and thawed out the day before you want to serve it. Could I substitute chickpea flour for the whole wheat flour? It may end up a bit too gluggy. Maybe try a mixture of chickpea flour and rice flour. Hi Anja, greetings from Germany! I’m so happy to have this recipe to make for my American friends on Christmas! Thank you- and so nice of you to dress in suchlovely festive apparel! Hello Anja, thank you for this recipe! I’m looking forward to making it, could you please tell me if the pineapple juice goes in to the mixture? I made it, and it was successful!!! Actually very easy to put together and quick!! Delicious, tasty and oh so yummy!!!! Served it for Sabbath lunch with banana nice cream and it was more than a hit. Shared some for a friends anniversary and still have a piece let that I am enjoying!!! I highly recommend this delicious recipe!!!!! So glad you like it as much as I do 🙂 … and that your friends liked it too!! I have used brown rice flour and my cake was great. Hey. Can it be stored like other christmas cakes, I mean wrapped in foil and left on a cupboard in the airtight container for at least a month? I won’t be home during Christmas and want to bake it a month before Christmas and leave it for my parents. Roughly 2 1/2 cups worth. But best to measure if you can. 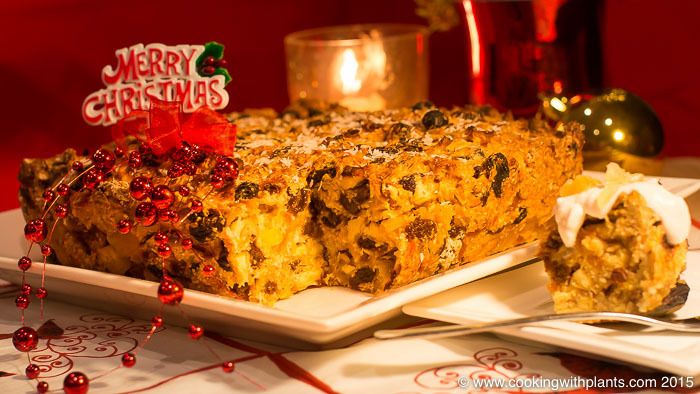 Anya, this is an amazing fruitcake! I highly recommend it for anyone desiring a dessert with no added sugar. As an added bonus it is simple to prepare. My entire extended family enjoyed this cake Christmas Day. I have served it several times, and it is now my go to dessert for get togethers. Thank you for your unique WFPB no added oil recipes. This was delicious! I made it for my non vegan family for Thanksgiving. It was well received but I still have so much left over. Next time I would make half the recipe. It is very dense and very sweet but I replaced the apples with dried blueberries and dried cherries. The dried ginger was a really nice addition but I wish I’d cut it into smaller pieces. Great recipe! Will spelt flour work just as well?